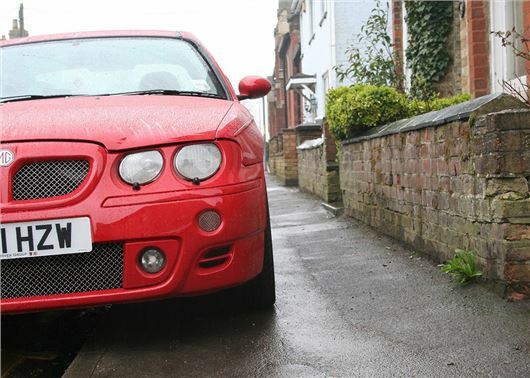 Motorists who park with their wheels up on the kerb may soon face fines of up to £70 after the Department for Transport (DfT) confirmed it was considering a review of current legislation on pavement parking. The evaluation is part of a wider review into traffic regulations, to be determined in 2018. The DfT will look at the impact of parking on the pavement and the hazards it causes to footpath users, as well as the broader impact on traffic flow and access for emergency vehicles, such as ambulances and fire tenders. Under current law, parking on the footpath is only illegal in London, where it has been an offence since 1974, though there are some streets in the capital where pavement parking is allowed and clearly signposted. However, on streets without signage to the contrary, drivers can already face a £130 penalty charge, which is reduced by half if paid within 14 days. In the rest of the UK, while the Highway Code says drivers ‘should not’ park on pavements, there’s no clear law to define against it, and there are many areas of the country where the practice is commonplace. Indeed, it was the concerns of people living in areas where pavement parking is rife that caused the previous Private Members’ Bill to stall in 2015, at its second reading. While there was a proposal to make parking wholly or partially on the footpath a civil offence, concerns over additional congestion and the impact on access for emergency vehicles, refuse trucks and delivery lorries meant the Bill wasn’t passed. Campaigners to ban pavement parking take a different view, with the charity Guide Dogs raising concerns that parking on footpaths is a major hazard to blind and partially sighted people, while pressure group Living Streets raises concerns about how the practice can cause an obstruction and inhibit the independence of many vulnerable individuals, especially older or disabled people with visual or mobility impairments. The group also raises concerns about dangers for families, where pram and pushchair users are forced into the road as they can’t get past parked vehicles on the pavement. At present, local councils have the power to introduce bylaws that prevent pavement parking on certain roads by raising a Traffic Regulation Order (TRO), but the Local Government Agency (LGA) believes that the process is needlessly bureaucratic and time-consuming. While it doesn’t call for a blanket ban on parking on footpaths, the LGA has previously lobbied for greater powers for local authorities, which would make it easier to outlaw parking with wheels up on the kerb, especially in areas where local residents have already raised concerns. The LGA also voices concerns around the repair and maintenance costs of pavement parking, arguing that the cost of fixing damaged pavements and kerbs could be better spent on repairing potholes. Irrespective of whether or not parking on the pavement is illegal, drivers can still be penalised for causing an obstruction through parking inconsiderately. Causing an obstruction can already lead to fines of up to £1000 under sections 99 and 101 of the 1988 Road Traffic Act, which applies to both footpath and road users. The Act also gives councils the powers to remove vehicles which it believes are creating a danger. Great but how is it going to work on narrow Victorian streets with terraced houses, surely you cannot make them all one way. We must have millions of properties like this and parking partly on the pavement seems to be the only answer without creating even more chaos. I agree entirely. We live in a village with narrow footpaths and no street lighting. Drivers frequently park with two wheels on the footpath not because they would otherwise actually obstruct traffic, but to protect their cars from possible damage by passing vehicles. In doing so they make it impossible for pedestrians to usethe pavement. I think it would be more effective and less antagonistic to issue warning notices to offending drivers before issuing tickets but there is no budget for this sort of reasonable community policing any more. My three daughters all live in areas where there is insufficient parking, narrow roads and where most properties are rented meaning that the majority of households have two or more vehicles. There is no alternative parking, particularly as two of my daughters live very close to schools. Once again, a money raising, legal scam but, more worryingly, from the Government and with no joined up thinking. I must agree about pushchairs, wheel chairs and people with disabilities having the right to be safe whilst walking but I do not see any alternative to the 'pavement parking'. Oh, and by the way, I thought the police were already unable to cope with all the street crime and violence so I guess they will definitely be equipped to police this one then?!! I believe it has always been an offence for vehicular traffic to use the footpaths, this includes PRAMS / SHOPPING TROLLEYS PARMA DISABLED ELECTRIC CHAIRS in fact all vehicular TRAFFIC.OK TAKE IF FROM HERE BAN ALL YOU CANNOT DISCRIMNATE. There is already a law forbidding a wheel on the pavement. It is not applied because a buggy has wheels so why a new law? Just apply that which exists or make amendments so mothers can wheel their little ones without let or hindrance. If the effect of this is to reduce the amount of on-street parking then more parking elsewhere will be needed. Will space be made available for parking elsewhere, "municipal car parks". These would need to be free, or available via resident permits if the cost was not to cause significant hardship. Alternatively - invest massively in public transport so that the need for private vehicles is reduced. I work with mentally and physically disabled adults. I also have small grandchildren in push chairs. Cars on pavements expose these people to unnecessary risk. It may seem old fashioned but roads are for cars and pavements for people. These horrendous "Chelsea tractors" occupy a big footprint on the road and if we were being honest they're not suitable for the UK roads, let alone being parked on roads designed for nothing larger than a large family car. I totally agree with you about pavement access for certain people but, unfortunately, they are in a minority and councils, government, builders and town planners haven't taken any of this into account for many, many years. Your attitude towards "Chelsea Tractors" is so old fashioned, you've already mentioned your grandchildren in pushchairs, tell me how you get two modern pushchairs in the back of Ford Fiesta? People have a right to have whatever vehicle they wish and latest passenger vehicles are getting bigger by the day. Just bear in mind that should this legislation get through (which it won't because common sense will prevail) urban areas will be no-go, house prices will tumble, and emergency services will have a very long walk to access their calls. Too many people, too many cars. Who is going to police this? Parking Wardens? There just is not enough room in this country anymore and roads have not changed with the population or culture. We live on a new housing estate built in 2005 and the builders put no thought at all into parking. The roads are narrow and if people do not park partially on the pavement there is no movement of any thing and if Ambulances come onto the estate they certainly cannot get to their destination and sadly there is lots of Ambulances who visit the estate. Access needs a great deal of thought as the motor car and other vehicles are not going to go away in this World come on poloticians get your heads out of the sand ! This would be a roundly stupid piece of legislation and would cause absolute chaos in some areas of towns and cities. I would propose that, should this legislation be passed, motorists park up fully and legally on the road in the full knowledge it would cause an obstruction. Then they should hammer their local authorities to do something about it when someone's house burns down because the fire service can't get to the fire. Many of the towns/cities in the UK were built up substantially before seeing massive car ownership. You can't then expect to make changes such as this without providing alternative parking sites. The existing law is sufficient as it is. Ensure that there is a gap of no less than one metre when you park up so no obstruction is caused - simples. Presumably it will work as well as it does in London where drivers in narrow Victorian streets don't park on the pavements. That's because the councils spent an awful lot of money on yellow paint !! A house an minute's walk from mine burnt down because soon before, the council had a purge on people parking on the pavement and the fire engines could not get to the fire. What about careless people who leave their kids' bikes/scooters/prams etc all over pavements? They should also be done for obstruction. And before anybody says "Yes but you can just move those out of your way".......a blind person cant and shouldnt have to. If you do try and move them somebody races out of their house and screams at you accusing you of trying to nick them! Simple, if the councils ban parking on pavements they could reduce the width of existing pavement to 1 metre ( where possible) and or remove the one on the other side. Why do you need 2 pavements on one road. This should make houses with off-road parking sell at a premium. The existing law is not sufficient as it is. It does not stop pavement parking. It is not applied. It is antisocial and a health and safety issue to pavement park. I live on a modern estate. The vast majority of the houses are detached. All houses have garages and drives, and most have double garages. If they cleared the junk out and were more disciplined, most cars could be out of site and on drives. It would look a lot tidier and enhance our quality of life. It would also make the road a lot easier to negotiate. I appreciate there are roads where special consideration is necessary, but our estate is crying out for this legislation. I look forward to this legislation being implemented. NickNike, I think you'd be better moving to Mars - get real and, anyway, people with double garages can fill them with as much 'junk' as they like, it's entirely up to them. Glad you're not aa neighbur of mine. Yes, I know I can't spell - "neighbour" !! I'm pleased the vast majority of comments agree with me, and not your antisocial attitude. Garages and drives were actually put there to get cars off the road. This leads to a more open, pleasant environment, it makes the road easier and safer to negotiate, and gives pedestrians and pushchairs a safer area. This all enhances the quality of life. Why do you have a problem with that? The modern attitude is one of irresponsibility, and the junk is symbolic of that. And I agree with you, I am very glad I am not a neigbour of yours. Time we elected govts.. that regard themselves as the peoples servants not their masters. The continual denial of the importance of the motor car to the lives of the people is absolutely remarkable from HS2 to "green" restrictive parking. It's bad enough that there is inadequate parking provision for our oldest housing stock, but inexcusable that modern developments are poorly catered for, thanks to greedy developers who maximise profits over longer term needs and inept planning authorities who do not properly supervise thes new developments. every where one goes cars are parked partially on pavements to the detriment of people walking, pushing prams, blind people ,any more? , I think that this problem being highlighted will lead to councils think of car owners as more cash cows than at present , ie , parking on pavements fine them ,easy money , they already have parking enforcement wardens , so easy money for councils . I hope this happens. As where I live we have a Petrol station & Shop & people park on the pavement,which obstructs the view as you exit.Also there is a Zebra Crossing there too!! On pavement parking should be illegal where to do so leaves less than one metre width of hard surface footpath available to pedestrians. At last somebody with the right idea. My estate is new and to pack as many houses as they can onto the site we have a very narrow road, Pavement parking is common and a problem but this should be dealt with at the planning stage. Councils pass the plans which I think should have a minimum parking area as a ratio of the number of properties to be built, especially if the property has no driveway. However, due to people's laziness on our estate even those with an allocated double bay 20 metres from the house, prefer to park high on the pavement. I am fortunate to have a double driveway but often get someone parking outside on the pavement and over the kerb drop point to my drive, blocking me in. They get a ticket ever time. A call to the local police quoting the sections 99 and 101 of the 1988 Road Traffic Act, which applies to both footpath and road users, often does the trick. Can't do much about older properties whose planners didn't foresee the increase in motor vehicle ownership, but today's council's have no excuse. Rant over and out. Parking on pavements should be an offence everywhere, if you have a car don't buy or rent a house without enough off road parking. Houses with a garden that can be accessed with a dropped kerb to park should pay up and they then get off road parking. If councils provide car parks then those who park there should have to pay for them. How about parking only at one side of narrow streets, switch sides alternate days. Employ parking wordens at night to travel round rural villages on electric scooter putting tickets on vehicles, it should produce a good profit to subsidise pothole repairs. The fact is that motorists are the most selfish bunch of humans yet discovered. They car nothing for anyone but their precious bit of metal and want no one to scape it or injure it.That is why pavement parking s bad in the country as well as ton. I live on a 30 mph limit ( big joke) but people would park when half a car on the pavement because they think it safer for their CAR. Sod the pedestrian who then needs to go into the road.Fines need to be punitive but who will enforce this? They car nothing!!!! great pun m8. Who will police this,where I live we have no longer any police presence or parking wardens.Cars already park on double yellow lines close to a zebra crossing making it difficult to pull out. Also parking on pavements near schools should be banned as it very dangerous. We have cars parked on footpaths in my area of Surrey. This issue should be included in the review as there are people who do not care about anybody but themselves. Go to Bordeaux in France and you will see how it works, Making streets one way is no hardship, you'll just have to re-learn how to use your legs again. Many old narrow streets in Spain are one way, and whilst it is a hardship for motorist it's great for walkers who were there before motorists. I live near Battle, East Sussex, pavement parking is a real problem here, as is total and complete disregard for parking on double yellow lines, safe in the knowledge that the Police have made it clear that they will no longer police parking unless an obstruction is caused. Pavements are for people and however much we like/use/rely on our cars they can not be allowed to dominate every aspect of life and I wholeheartedly support a ban on pavement parking and the enforcement of fines. Far too many people are selfish and have no consideration for others. My late mother was registered blind and so I have some appreciation of the problems people with sight impairment suffer when pavements are blocked. We do need more police resources and a will to enforce the law, all the while people have a fair chance of getting away with offences they will try to do so. tHE TROUBLE IS THAT THIIS BEHAVIOUR WHICH IS A PEDESTRIAN SAFETY PROBLEM AND THE SCOURGE OF AMENITY PAVING AND GRASS VERGES HAS BEEN IGNORED FOR DECADES AS THE SO CALLED POVERTY NATION HAS HAD TO FIND PARKING OUTSIDE THEIR OWN LAND IN ORDER TO HOUSE THEIR NUMEROUS VEHICLES .These are not only cars.Years ago property deeds forbade tradesmen from carrying on their businesses in their homes this not least was to stop areas being downgraded by builders trucks. agricultural maintenance, estate agent etc vehicles.By parking on the streets/pavements the cost of providing garaging etc is avoided. Not only parking damages pavements but large builders delivery lorries crane/hoist vehicles etc all cost millions of wasted pounds sterling each year. Without enforcement, a complete waste of time. "......the Highway Code says drivers ‘should not’ park on pavements, there’s no clear law to define against it....."
But Highway Code 145 : "You MUST NOT drive on or over a pavement, footpath or bridleway except to gain lawful access to property, or in the case of an emergency." So unless you've had your car lifted by a Chinook onto the pavement, you have broken the law getting there. The only places this new law would cause a real problem are in those inner city areas which were built when there were few cars bigger than an Austin 7. The answer is to make those narrow streets into pedestrian precincts, but with access and parking for vehicles allowed. Motorists would still be able to have access and parking, but have the onus of ensuring that pedestrians have the required consideration. If you own a car please make certain you can park off road. I have always made sure I can and have paid to do so. Obstructing the footpath to wheelchairs/pushchairs with the dangers involved to carers and parents and the obstruction of our roads to traffic and public service vehicles in particular is unkind. We drivers can be very selfish and the need to park often overcomes our basic decency. Several people have made comments about narrow roads from the victorian times. My daughter lives in a "trendy" new estate built in Portishead in the last five years, by 6 o clock in the evening nearly every footpath has vehicles parked along their length. This is due to the narrow roads, inadequate provision of parking and the greed of the developers wanting to get a few extra houses on the site to maximise profits. The roads are built narrow and wind their way through the estate with many blind bends to slow traffic down. Delivery lorries, refuse vehicles and the emergency services all find it difficult to get vehicles into and out of this new area of the town. Who is to blame for this rediculous situation Planners, Architects, Developers, none of whom live on the estates they build. Park on pavements , block the road, what should I do? Most of the uk to be demolished. All rebuilt housing / roads to have bridleway plus footpath plus cycle way no exceptions. All domestic properties to have living space above a specified legal minimum. All roads to have bridleways / footpaths cycleways. All domestic properties to have minimum off road space for 2 cars. Uk to have no more than 25 million domestic dwelling units of any type no ifs / buts for all time.